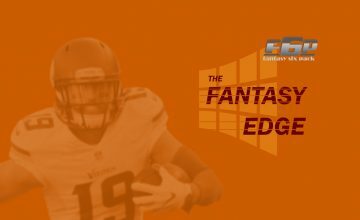 As we are heading closer and closer to the best time of the year, NO, NOT the Super Bowl, and NO NOT the World Series, I am talking about our fantasy football drafts. The excitement is right around the corner. Did you start preparing yet? If not, what are you waiting for? 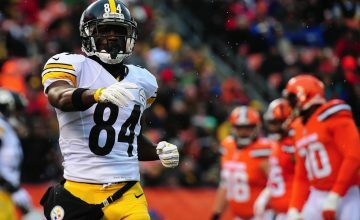 I don’t want you to feel left behind so take a look at the list of seven wide receiver sleepers that you can highlight on your tier sheet or place in your player queue in the 2018 Fantasy Football Wide Receivers Sleepers. Geronimo Allison is entering his third year and was an undrafted free agent. He enters training camp as the number three receiver on the Packers wide receiver depth chart. When the Packers released veteran receiver Jordy Nelson, all eyes focused on the third receiver position for the high-octane offense of the Packers. Presently, it seems that Allison is in a great position to secure a starting job in the Packers offense. The Packers have no shortage of potential at wide receiver. However, there are some real question marks ahead of the season. With the Packers unsure of the status of their receivers outside of emerging superstar Davonte Adams, the Packers made three final-day draft picks in J’Mon Moore, Marquez Valdes-Scantling, and Equanimeous St. Brown. Randall Cobb, who starts opposite Adams, has had strong seasons before, but his performances have fallen off recently. He is not the same player since his career year in 2014. That was Cobb’s only 1,000-yard season as well as the only time he has recorded double-digit touchdowns. Also, his average over the past three seasons is only 10 yards per reception. The question now is whether Allison can step up into a bigger role. We’ll get a much better idea at training camp and in the preseason. Acccording to Fantasy Football Calculator, he comes off the board around the 13th round, but his upside is a solid WR2. Instead of using a pick on DeSean Jackson or Tyler Lockett pick up Allison who could have excellent fantasy value considering his draft price. 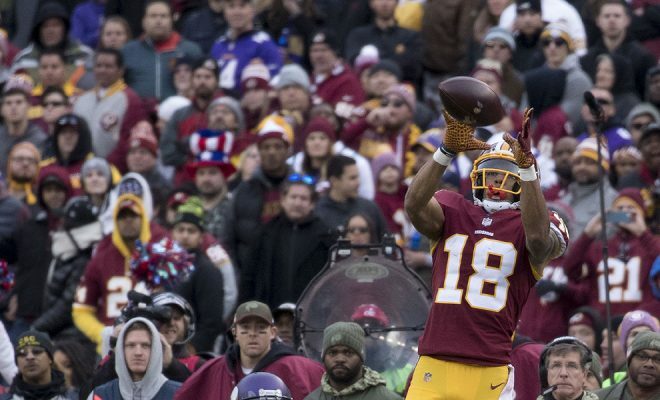 The Washington Redskins expect wide receiver Josh Doctson to fill a huge void as the No.1 receiver on the Redskins offense. Last season, he compiled 35 receptions for 502 yards and six touchdowns, and the door is wide open for Doctson to be the No.1 wide receiver. The reality is that Doctson is a huge disappointment; especially as the 22nd pick in the draft two years ago. Doctson does not have a 100-yard receiving game, nor has he caught more than four passes in a single game. Josh Doctson faces the most important season of his young career. Over his two seasons in the NFL, he has faced durability issues. These injuries have led to a lack of consistency and success. Doctson did have flashes last season, but he didn’t get the opportunities he should have until mid-season. Now there is a new X-factor. Enter quarterback Alex Smith. In his five years with the Chiefs, Smith never had a receiver with the size and jumping ability of Doctson. At 6-foot-2, he is already one of the leagues best at going after 50-50 balls. Smith can only help him to improve his short and intermediate game. Doctson enters training camp as the Redskins No.1 receiver. He needs to stay healthy and prove that he is the Redskins future at the receiver position. In his prove it season, I think with the help of the veteran Alex Smith, Doctson reaches new levels. Doctson has the best season of his career, catching 65 passes for 900 yards and nine touchdowns. Pierre Garcon is a proven possession receiver, who will serve as the No.1 receiver for the 49ers. Garcon had exactly 500 receiving yards halfway through the season a year ago-before his Week 8 neck injury landed him on injured reserve. Those numbers came from quarterbacks Brian Hoyer and C.J. Beathard. Garcon never got to work with Jimmy Garoppolo after suffering his season-ending neck injury. The passing game in San Francisco has the potential to be elite. 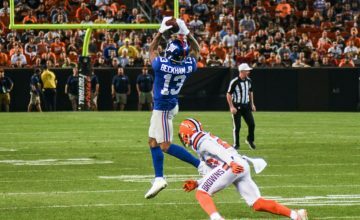 Garcon’s name alone will command the attention of defenses across the league, thereby opening up more opportunities for Marquise Goodwin, Trent Taylor, George Kittle and Jerrick McKinnon. With his familiarity of head coach Kyle Shanahan’s complex offense, Garcon will be a major force in this 49ers offense. His physicality and toughness make him an ideal possession receiver. His reliability makes him a worthy target on draft day. Garcon currently drafts as the 36th ranked receiver/85th overall. That’s tremendous value for a WR2 or a flex player, especially in PPR formats. Tampa Bay Buccaneers wide receiver Chris Godwin finished last season with 34 catches for 525 yards and one touchdown in 2017 during his rookie season. As a result, Pro Football Focus has graded Godwin among the top wide receivers from last season, just behind Cooper Kupp. Godwin had a quiet start to his NFL career, with just eight catches for 83 yards in his first eight games. In Week 10, he stepped in for the suspended Mike Evans and caught five passes for 68 yards. That catapulted him into a impressive second half. He had 26 catches for 442 yards, including a seven reception, 111-yard explosion game against the Saints.He also hauled in his first career touchdown for a game-winning score on a Jameis Winston‘s final throw of the 2017 season. The third-round pick in 2017 emerged and established himself as one of the team’s most lethal targets. Godwin prepares to have an even better season in 2018. He showcased his big-play ability by his yards per target last season. Mike Evans (7.36) and DeSean Jackson (7.42) were well behind Godwin, who averaged 9.54, who was second on the team behind second-year tight end O.J. Howard (11.07). Godwin’s status as a sleeper will be more evident while quarterback Jameis Winston sits for the first three games due to a suspension. Veteran gunslinger Ryan Fitzpatrick will start in those games, but he’s very well known to have tunnel vision when it comes to his receivers. Once Winston comes back, watch out for the breakout of Chris Godwin. The addition of Mike Wallace to the Eagles offense will be scary to watch. Wallace takes over the role that Torrey Smith had. Smith was there to bring his downfield speed and to take the top off of the defense. He was quite a disappointment, ending the year with 36 receptions for 430 yards and only two touchdowns. Smith averaged a career-low 11.9 yards per reception. Mike Wallace is better and more talented than Smith. Wallace can still fly, and you will see Wallace catching bombs from Wentz in 2018. Wallace had 52 receptions for 748 yards and four touchdowns last season and that was with Joe Flacco throwing him the ball. With Alshon Jeffery, Nelson Agholor and Zach Ertz leading the Eagles in the receiving department, Wallace should benefit from seeing passes thrown in his direction while opposing defenses focus on those playmakers. His career average per reception is 15 yards and is a big play waiting to happen. He may only have found the end zone eight times since the 2016 season. The main reason the Eagles brought him to Philadelphia? He caught 124 passes for 1.765 yards. Look for Wallace to catch about 50 passes for 900-1000 yards and eight touchdowns. Not bad for a player with an average ADP of 88 at wide receiver. James Washington comes out Oklahoma State as one of the most decorated wideouts in the 2018 NFL Draft. He won the Biletnikoff Award as the nation’s top receiver, he was a unanimous first-team All-American, and he finished the season with 1,549 yards and 13 touchdowns. The Steelers were fortunate to grab him in the second round. Regarded as more of a deep threat in college, he has a chance to grab a slot role with the Steelers offense and play alongside Antonio Brown and 2017 second-round pick JuJu Smith-Schuster. With Martavis Bryant traded to Oakland, Washington could develop to become a dynamic weapon for Ben Roethlisberger. His ability to play inside and outside places him in a unique position to make some huge plays against coverage too concerned about Leveon Bell, Smith-Schuster, and Antonio Brown. Washington was a big-play receiver at Oklahoma State. The 22 deep receptions that he had in 2017 produced 882 receiving yards – 155 were yards after the catch. Eight of those receptions resulted in touchdowns. In sum, those 22 receptions resulted in an average gain of 40.1 yards! Fantasy owners should get him onto their watchlists in their drafts and auctions. The Steelers offense is going to be more lethal in 2018. Chargers’ tight end Hunter Henry‘s season-ending knee injury opens the door for someone to become Philip Rivers‘ No.2 target behind Keenan Allen. The Chargers are hoping that the former No,7 overall pick from the NFL draft Mike Williams answers it. His 6-foot-3, 220-pound frame makes him the ideal target for Rivers. He has a chance to become the guy that Rivers can throw 50/50 deep passes to. On paper, Williams could be a solid red zone threat. The pressure is now on Mike Williams as he enters his sophomore season with a clean bill of health and huge expectations. Williams is coming off a season in which he only caught 11 passes with no touchdowns. He dealt with injury all of training camp and half of the season. He did not even see the field until Week Six. His ability to stay healthy throughout this training camp is vital to him and this team’s success. Unfortunately, Williams staying healthy has been an issue for him. While playing for Clemson in 2015, he collided with a goal post after catching a touchdown pass. The collision resulted in a fractured bone in his neck and a lost season. He didn’t disappoint as led Clemson to a national championship with 98 catches, 1,361 yards, 11 touchdowns and one dominant performance against Alabama. Mike Williams has a very high ceiling with a big-bodied frame. However, he has to have a healthy, productive year in 2018. He has a lot to prove, and staying healthy could provide the Chargers with a dynamite duo at receiver. I expect an exciting and breakout season from the second-year wideout.